All of Larson Packaging Company’s wood products are Heat Treated in compliance with ISPM-15. We are certified to produce heat-treated wood products for export and audited monthly by Timber Products Inspection. We know the rules for each country and provide the phytosanitary certificates you need so your shipment will not be delayed in customs. ISPM-15 is the international standard for phytosanitary measures regulating the use of wood packaging material in international trade. These measures reduce the risk of introduction and spread of quarantine pests associated with the movement in international trade of wood packaging material made from raw wood. Wood packaging material covered by this standard includes dunnage but excludes wood packaging made from wood processed in such a way that it is free from pests (e.g. plywood). ISPM-15 requirements apply to all species of coniferous (softwood) and non-coniferous (hardwood) packaging materials. 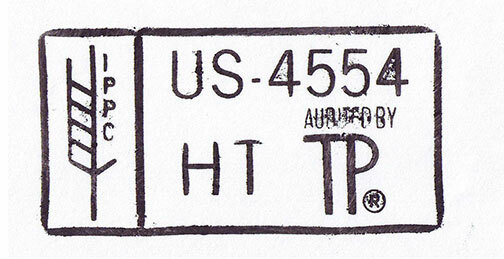 ISPM-15 requires that solid wood packaging materials be treated to eliminate the threat of pests via two treatment options, but the predominant method is Heat Treatment (HT): Wood packaging material should be heated in a schedule that achieves a minimum core temperature of 56ºC for a minimum of 30 minutes.